Give ‘em something to wow about! Apply the brow highlighter pencil under your brow following the arch. Lightly blend for a visible lift. Gimme an eye opener! Brush gimme brow volumizing fiber gel through brow hair then stroke high brow under brow arch. Tada! How will High Brow transform your look? See for yourself...with our new virtual Brow Try-On! Check out the product payoff on your brows and find your perfect shade. How do I sharpen the pencil? 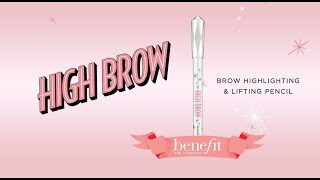 What is the difference between the old & new high brow? Hi gorgeous! The new High Brow has a creamier softer formula and this is easier to blend and has better payoff on all skin tones. We still have the same Linen Pink and Champagne pink colors just BETTER formulas!